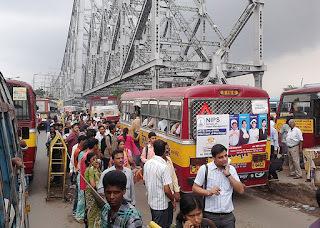 People who arrive at Howrah Station in Kolkata late at night have difficulties to go to their destinations because of non availability of buses or minibuses - and the taxis charge exorbitant rates. Therefore, a need had been felt for a long time to have buses operate late at night. That decision has, now, been taken and buses and minibuses will ply between Howrah station and various parts of the city from 2.30am every night. This night service will begin immediately and would be a boon to people arriving at Howrah station late at night. This has been reported in telegraphindia.com dated 1 March 2016. To begin with, there would be a fleet of 12 buses and 8 minibuses that will ferry passengers between Howrah station and Sealdah, Sector V, Karunamoyee, Kasba, Gariahat and Ballygunge Phari from 2.30am to 5am. The fares will remain unchanged and the buses and minibuses will do two round trips on every route. A transport department official has indicated that police in Calcutta and Howrah and the public vehicles department have given the necessary clearances. The buses will start from the Golabari police kiosk, where police would be heavily deployed to instill a sense of security among passengers. Officers in Lalbazar have promised to provide vehicles plying at night with proper security. such a system will be a boon to people who land up in the city late at night ..